Mr. Charles Dow and Mr. Edward Jones probably felt this way at the launch of their now-famous average. A benchmark price index established by a reputable publisher is a significant milestone for any industry. Its importance becomes amplified with the benefit of hindsight. This week, CoinDesk launches its proprietary Bitcoin Price Index (BPI) aiming to establish the standard retail price reference for industry participants and accounting professionals. Wholesale exchanges and dark pools may trade around other price points, but those are usually private trades and not available to retail businesses and individuals. It is believed that this is preferable to simply discarding the outlier price because in some instances the outlier price may be the most accurate. According to CoinDesk developers, the criteria are subject to modification based on changing market and regulatory conditions and they intend to keep any revisions to the formula on a predictable monthly schedule. This will increase the credibility of the index because users will have some advance notice with respect to the formula updates and associated rationale for those updates. Starting a new index can be a tricky endeavor because it must appeal to the lowest common denominator to be broadly applicable yet it must be selective enough to maximize market-based price discovery. The Mt. Gox exchange price had been the early leader in terms of adopted usage of their API, but increasingly that has caused problems for companies attempting to benchmark average price while not having adequate access to the Gox platform. Due to Mt. Gox banking delays in transferring US dollars out, a spread of approximately 10% has existed between Mt. Gox and other bitcoin exchanges for several months now causing distortion in real-time conversions that depended on the API. This spread has been as high as 20% at times. 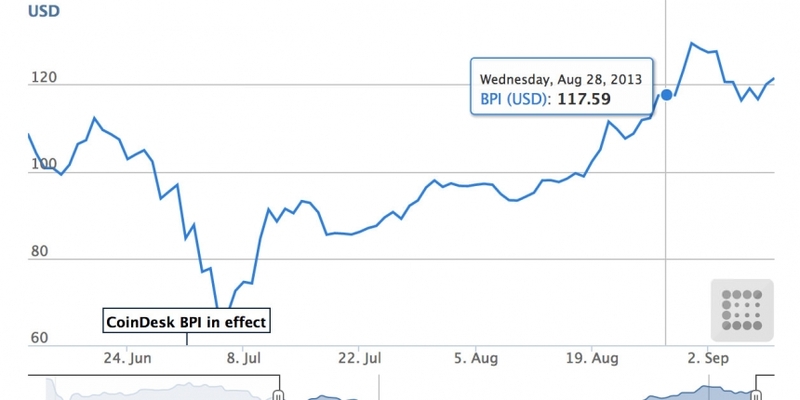 As a result, businesses such as BitPay and LocalBitcoins.com have already moved away from using the Gox pricing API. Initially, the CoinDesk Bitcoin Price Index will be based on XBT/USD price data from Bitstamp, BTC-e, and CampBX using each exchange’s bid/ask midpoint and without volume-weighting. The decision not to weight the component exchange prices based on trading volume was made because the bitcoin market is currently not deep enough. It tends to be more dispersed by region and a volume-weighted index would not act as a proper global indicator. This is expected to change over time as more bitcoin exchanges gain trading volume in different countries thereby weakening the impact of regional variances. At that point, it is anticipated that the bitcoin market would be mature enough to apply a volume-weighted approach. In addition to a real-time API updated every 60 seconds, CoinDesk will provide a GMT (Greenwich Mean Time) end-of-day closing index price including a high price and a low price for the daily trading period. The historical index data will commence on July 1st, 2013 and any data prior to that date will be based on the Mt. 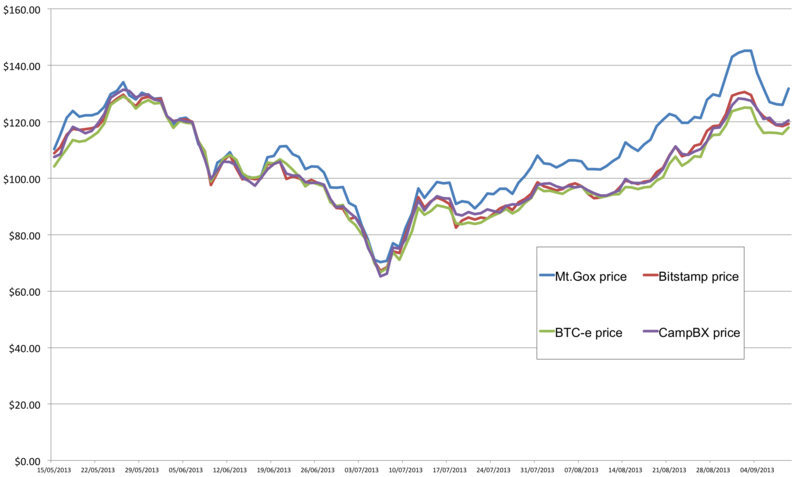 Gox price data previously recorded by CoinDesk. Therefore, users will see a drop in the historical index from June 30th, 2013 to July 1st, 2013 but the transition and formula details will be cited in the explanatory notes. The representation of the Bitcoin Price Index in other national currency units will be provided by applying exchange rates from openexchangerates.org until those other bitcoin trading pairs reach sufficient trading volume. That level will most likely be reached earliest by the XBT/EUR trading pair. The XBT designation as bitcoin’s ISO 4217 currency code is accepted by both XE.com and OANDA for their current data feed. As Bloomberg terminal and other trading platforms adopt XBT, the CoinDesk Bitcoin Price Index could increasingly become the de facto metric for recording historical and current exchange rates for bitcoin. Check out the Bitcoin Price Index page to find out more. As of 1st October 2013, the Bitcoin Foundation is using the CoinDesk BPI to determine its membership fees.